NASA's new space station toilet, shown here, is a $19 million commode based on a Russian design. One of two toilets on the International Space Station isapparently broken, NASA announced Sunday. It's too early to tell if the toilet has a serious problem,or can be fixed quickly, space station flight director Brian Smith said. The station is currently hostto 13 people - a record number of crewmembers onboard at once. While thattoilet, which is in the U.S. Destiny laboratory, is down, astronauts can use theother almost identical facility in the Russian Zvezda service module, as wellas the toilet onboard the space shuttle Endeavour, which has been dockedsince Friday. "We don?t yet know the extent of the problem,"Smith said. "It could turn out to be of no consequence at all. It couldturn out to be significant." Station crews are investigating the symptoms of the balkytoilet, which appears to have a flooded liquid separator. 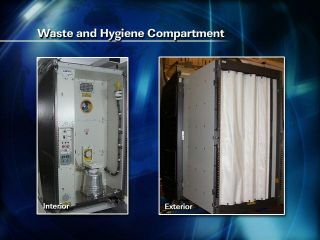 This $19 millioncommode wasdelivered to the station by the STS-126 shuttle mission in November 2008. Mission managers aren't sure yet how long the astronauts canlast with only two toilets. The station recently expanded its crew size fromthree to six people, putting further strain on the existing facilities. If needed, astronauts can use a bag system similar to whatApollo astronauts had to use, instead of a toilet. The shuttle bathroom is also further constrained by the factthat it can't dump any waste water while docked to the station because thewater could pose a contamination risk to the new Japanese exposed sciencefacility that was installed yesterday near the shuttle's perch. For now, this is not a serious problem, Smith said. "For right now having all the shuttle crew membersusing the facilities on the orbiter is not going to be an issue," Smithsaid. "If it proves to be long term then we'll readdress the situation andsee what we have to do. In the short term there is no issue." The space station has had toilettroubles before. The other bathroom in the Russian segment of the spacestation broke last year when a pump failed that enabled the toilet to collectliquid waste. That issue was fixed in June 2008 when astronauts installed areplacement pump delivered by the shuttle Discovery's STS-124 mission.